Completed in 1891, the Bluff Dale Bridge is a exceedingly rare example of a nineteenth-century cable-stayed bridge. The bridge spans 225 feet and has seven one-inch cables that run the length of each side. Towers made of nine-inch pipe support the cables 28 feet above the water. 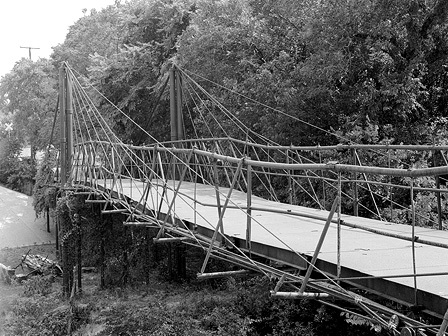 The bridge is built over the Paluxy River about halfway between Stephenville and Granbury and served as the principal crossing of the river until 1934. The Fort Worth and Rio Grande Railroad built through the area in 1889 and the town became a livestock shipping port for local ranchers. The bridge is in an advanced state of deterioration. It was closed to vehicular traffic in 1989 because of the cables are extremely frayed and the pipes that support the bridge are no longer safe for traffic. Since being taken out of service, maintenance has been non-existent. TXDOT applied for Transportation Enhancement funds for a Historic Bridge Preservation Program in 2006 and the Bluff Dale Bridge was included in the proposal. However, two years ago TXDOT corrected agency budget problems by canceling the enhancement program. As a result, Bluff Dale and 40 other historic bridges in Texas are without rehabilitation funds.